Rise of the Eco-Wariors - Every individual matters. 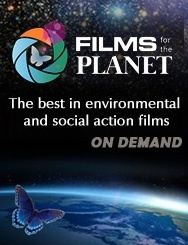 Every action counts A film by Cathy Henkel. What can eleven young people, a daring scientist and millions of online supporters achieve in 100 days in the jungle to stop deforestation and save Planet Earth? Rise of the Eco-Warriors (REW) tells the story of a group of young people selected from across the globe who leave their known worlds behind for the jungles of Borneo. They team up with acclaimed scientist Dr. Willie Smits, who runs an operation to rescue displaced orangutans, regenerate forests and support the local Dayak communities. He has a bold and ambitious plan for a long-term solution to the crisis unfolding from massive deforestation. He needs a team of brave, committed and smart young people to help implement the plan. There are multiple risks, challenges and obstacles as they go on a roller-coaster ride of action and emotion. Their tasks will at times feel impossible, the challenges too daunting and the orangutans in their care may become ill or stolen by poachers. But the Eco-Warriors are not working alone: behind them is a 'cavalry' of global support, comprising school students and online supporters connected via the project's code name DeforestAction. They work as Earth Watchers, using a satellite monitoring system to detect disturbances in the rainforest and report them to the Eco-Warriors on the ground in Borneo. Despite moratorium, Indonesia now has the highest deforestation rate in the world, topping even Brazil which has more than five times the natural forest cover. According to the World Bank (2001), 75% of the timber is harvested illegally in Indonesia. Everyday large areas of forest disappear and we urgently need to increase awareness and stop the complete depletion of the forest. This project represents young people determined to save their world from needless destruction and make a strategic shift from despair to hope as a source of positive action. The project has already harnessed the power and energy of school students and young people across the globe as both Earth Watchers and Action Agents. This is a story about what it takes to be an eco-warrior, an individual willing to step up and do something to avert a global catastrophe. All are driven by the belief that we can save our forests, and it is better to do one thing than nothing at all. Want to book a screening?